Most of the time, I am looking forward. I’m looking at what future I will create and how I will create it. I’m looking at what I will do to improve conditions in my own life and in the lives of others. I am looking at what is needed in order to make things better on this planet. I am helped and inspired by the man whose home I had the opportunity to visit in Phoenix, Arizona—L. Ron Hubbard, founder of the Scientology religion. Mr. Hubbard lived in Phoenix in the 50’s and his home is meticulously restored down to every last detail. Looking at this picture I began thinking about the food/cooking/health scene in that period of time. It was post WWII, so farmers were already being sold on the idea that chemicals left over from making bombs could be put into the soil to produce bumper crops. We won’t go down this road in detail right now. Let’s just say this led to weakened soil, the necessity for more chemicals, problems with livestock which then required antibiotics and hormones, more weakened soil attacked by more pests, more chemicals . . . .and look where we’re at now. Genetically modified foods created so they won’t die when huge amounts of pesticides–more toxic than ever before–are applied to them. In decades past, you could not buy foods from across the globe so readily because shipping was slower and much less efficient. It was easier to maintain a diet that followed the seasons of the year and it encouraged us to eat the foods that were indigenous to our own climate—at least somewhat. Why would we want to do that? It promotes natural balance and harmony with our environment. For some time now, we’ve been able to get just about any food from anywhere. Many of the so-called “miracle foods” come from environments far outside of my own, such as coconut products that are so popular now. What were some of the new health and diet developments in the fifties? White Castle and A&W fast food had already existed for decades, but in the fifties “Insta-Burger King” later to be renamed as Burger King showed up. Nutritionist and author Adelle Davis was becoming popular. She was known as much for her anti-processing stand on foods and her criticizm of the food industry as much as she was for her ideas on vitamins and diet. Jack LaLanne became America’s first fitness and exercise guru. Microwave ovens—one of the worst, health-destroying inventions in my opinion—came out. I grew up in the fifties and I well remember many of these things. I watched Jack La Lanne on television doing his isometrics. We ate TV dinners and just about any other new thing that came out. My mother was facinated by all the new food products. I learned the four food groups in school and I remember the first Burger King that opened in our town. My own history regarding food is likely only interesting to just me so we can skip the details and list out: heavy meat and dairy as a child, learning about the problems being confronted by the United Farm Workers Union and joining the organization as a kid, getting totally hooked on “working out” at the gym coupled with a LOT of protein supplementation, taking a complete 180 and going all vegetarian. Staying vegetarian for thirty plus years and then temporarily going back to animal foods while still eating all the grains and veggies. Gaining a LOT of weight. Losing the weight with a very individualized diet. Realizing I paid a price health-wise while “dieting,” and now, coming to my own conclusions about what I need to eat and what I don’t want to consume any more which pretty much brought me back full circle to a whole foods, plant-based diet. And cooking, cooking, cooking all the while! I’ve learned so very much over the years! You don’t need to eat meat, eggs and dairy food in order to have protein. Children can thrive wonderfully well on a vegetarian diet as long as it is balanced. You cannot leave out an entire category of foods, such as “carbohydrates,” for very long and stay healthy. You gain weight by indulging in too many refined foods, whether they are vegetarian or not, and eating more food than you can easily use. The body requires daily exercise. You do not need to focus on individual vitamins or nutrients if you are eating organic, mineral-rich food. By the same token, even the best organic-quality food today is weakened and you can assist yourself without “losing balance” with something like wild-harvested whole micoalgae such as Super Blue Green Algae. The way I have learned what “balanced diet” means, is by studying the effects of various foods, observing these effects, and getting into and maintaining a dietary balance for a long period of time. I used the eastern viewpoint of balance (yin and yang) to understand this. Now, no matter how far and wide I’ve gone food-wise, I definitely know when I’ve lost my balance and I know how to regain it quickly. Further, we can be very much at cause over our environment food-wise by how we choose to eat. Cooking is a beautiful example of that because there is a myriad of food preparations and techniques with which we can change our foods into what we want and need. Where does this all lead? It leads to my own phraseology, “Free Eating.” It means that when one has a basic understanding of foods and their effects, of how to prepare foods in order to change them and create the effects you want, you have less rules, not more. Less intense focus on diet and food, not more. Less living to eat and much much more eating to live! My own approach is that I want to eat real food, not fake, chemicalized food. Naturally occuring food is what I want. Whole food is what I want. And I want my food to be colorful, beautiful and the most delicious in the world. Where have you been and what have you learned? Where are you headed and what do you want? This entry was posted in Cooking, Health, Lifestyle, Vegan and tagged Adelle Davis, Burger King, Eating, Food, health, Jack LaLanne, Scientology, Vegetarianism by mycookinglifebypatty. Bookmark the permalink. That was one of my first books on “healthy” eating, Cindy. I thoroughly enjoyed reading this post…found it through researching vintage stoves, which I just bought…a 1950’s Wedgewood. I’m now strongly considering remodeling our kitchen in the 50’s style. 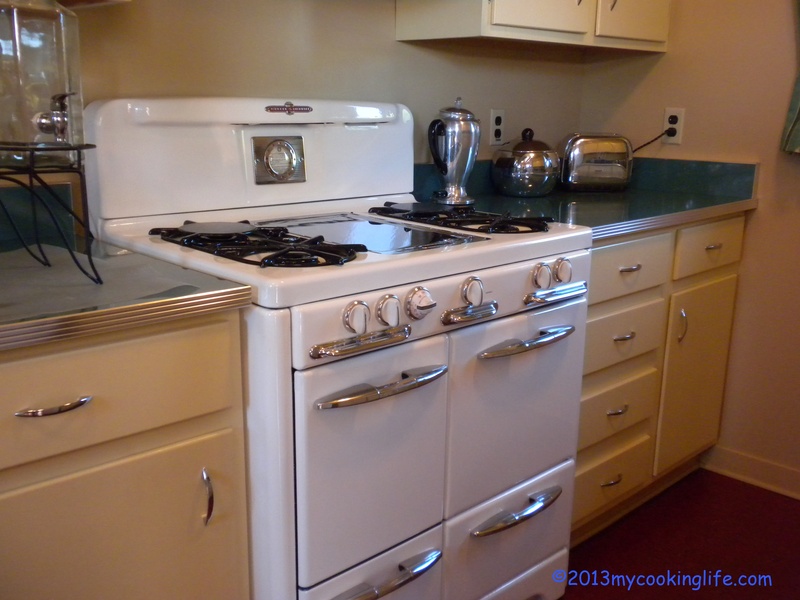 It was built in 1950, but it had a Thermador electric cooktop and built in wall oven…don’t know if it had been remodeled or not, since we bought it in 1974. Anyway, back to your post…around the mid 70’s, we started cutting way down on red meat, and started eating much more “clean” foods…lots of salads, fruit, veggies, juicing…and feel so much better. Because we have a special needs child…who is over 40 now…we know we have to eat in a way that our bodies will stay healthy and strong, so we can continue to take care of her, and eating fresh, green foods is our best bet to accomplish that. I cringe when I see my grandkids eating bacon, Burger King, Dr. Pepper…they just won’t listen, but I hope that they will see how and why we stay fit and young looking…at some point, they will want that for themselves and perhaps give up the junk, and, as you say, eat to live. Mary, thank you so much for your comments. I had no idea the stove photo would draw interest. I love the 50’s style and hope you’ll let me know how your remodel turns out! Sounds like you have quite a lot of experience with improving food choices and I’ll bet you’ve seen great results from doing that. I know what you mean about seeing loved ones eat (excuse the expression) “crap.” At least you are setting a great example for those grandkids and no doubt they’ll one day understand the wisdom of your ways. Great blog, Patty. I’ve learned many of the same things that you have over the years. I keep re-discovering that coffee is not good for me. As much as I love it–and go back to it again and again–it seems that this body does not handle it well. It’s a shame when something we love doesn’t love us back, isn’t it? Thank you Kathy! Yes, I have the same bad relationship with ice cream but I’m going to learn how to make my own vegan, grain sweetened type!